It’s a rite of passage, isn’t it? Pack up your bags and head for British shores, pull pints in a pub or become one of the many fabled Kiwi baristas of London. Bid farewell to Aotearoa and see what the big bad world has in store for you. Leave loved ones behind, or bring them along for the ride. And if you’re doing it as a band many of the same rules apply. Some will be able to come along for the journey, others may stay back at home. So it was that The Eversons, originally of Wellington, most recently of Auckland, and currently of London went from four, to five, to six, to five – and back to the original four again. Blair Everson (he of naming rights), Tim Shann, Mark Turner and Chris Young are where things all started out. Their connections to one another came from different directions – Mark and Chris had toured together while in different bands, Tim had carried sound duties at a few shows they’d played, and Chris had met Blair through that connector of young Kiwi musos, Smokefreerockquest. At a few years younger than the rest of the guys in the band, Blair claims a sense of admiration for the rest of the gang from way back. Mark had put an EP-worth of songs together, and the next key step was having a band to play them. But as with any new creative venture, there were a few obstacles as Chris muses. 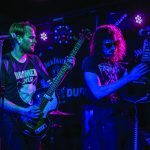 Ignoring a brief dalliance with a metal drummer, the line-up pretty soon cemented itself as being those key four – with Tim somewhat unwillingly taking on drum duties. The Eversons have been playing together for over five years now, and they’ve gone through a fair amount of evolution in terms of their sound. Some of that can be chalked up to time and changing interests – but a more significant cause is the evolving band personnel. The move to London isn’t the first that The Eversons have undertaken together. When they made their first collective move as a band, relocating from Wellington to Auckland, they brought on Alex Freer for drum duties. Nowadays Alex is kept busy with his role in Tiny Ruins, but he was instrumental (pun intended) in changing up the sound – as was Jacob Moore, formerly of The Checks. Appropriately for their now London-based lifestyle, Tim describes their latest performances as being “almost punk”. The rest of the band are on board with the idea that the changing line ups behind the changing sound – even now that they’re back to the original four. 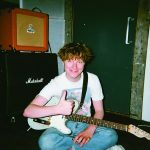 When the idea of shifting over to the UK was first floated, Jacob was going to be going along for the ride, but plans changed and so too did the band’s line-up. Still, the legacy of the other members lives on. “One of the things we joke about is that Alex and Jacob kind of gave Tim a masterclass in rock drums,” laughs Blair. “Somehow I hadn’t played drums for like 2 or 3 years, and when I tried to play again, I was better than when I last left them – it was hilarious. I just channel my inner Jacob,” Tim agrees. Tim’s the brains behind the band’s self-production while quintessential Kiwi indie label Lil’ Chief Records carry out the distribution and marketing. The title originates with a track that riffs on the idea of being trapped in paradise, as Mark elaborates. While London opens up a great many doors, it’s also come with its own adjustments and challenges. They also note a trend towards style over substance – something that they reckon wouldn’t fly back home. Soldiering on they practise, they record, they play gigs. Tour opportunities are lined up in France and Germany with another Kiwi band, Moses. And sometimes the allure of the home crowd is assuaged by home comforts appearing in the post. When asked about any Wellington or Aotearoa things they miss, Tim immediately responds. Maybe that’s the dual pronged approach of Kiwi culture taking over the world: coffee and kickass music. The Eversons are a damn good choice when it comes to leading that charge. 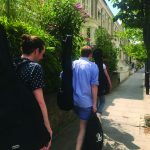 “All of us had experiences where we’d done various projects where the projects weren’t quite fully realised – or there had been various frustrations”, says Chris. “So we went into the band consciously thinking that we’re all on the same level, none of us are too precious. So we can have quite a direct approach to just make exactly what we want. Both at home, and abroad, it would seem.